I'm so glad that nasty eye infection cleared up. Now you can see my gorgeous peepers. If your cat is diagnosed with conjunctivitis, or inflammation of the whites of his eyes, there's an approximately 30 percent chance it's a result of chlamydia. You know that chlamydia is a sexually-transmitted infection in people, but that's not how Kitty got it. Chlamydia might also affect his respiratory tract. The strain of chlamydia affecting cats is Chlamydia felis, formerly known as Chlamydia psittaci. It's also called feline pneumonitis. Cats pick up this organism directly from infected felines, with kittens far more likely to suffer from it than adult cats with healthy immune systems. 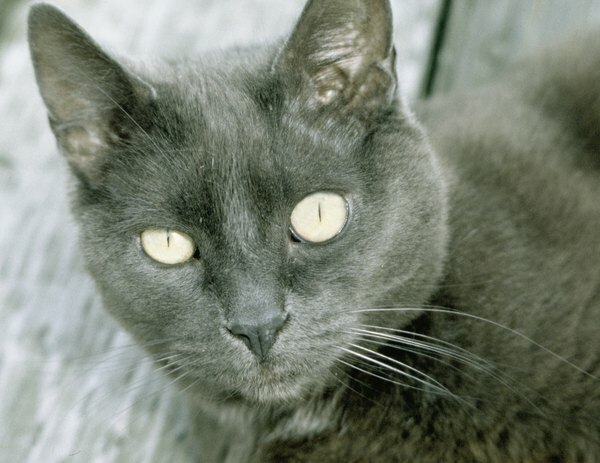 After picking up the infection, affected felines show symptoms within 3 to 10 days. The bacteria responsible for chlamydia resides inside the cells of the host. 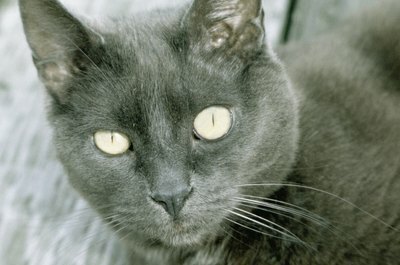 Early signs of chlamydia eye infections are red, swollen conjunctiva in one of cat's eyes. Within a couple of days, both eyes are inflamed. There might be a discharge coming out of Kitty's eyes, either watery or with pus. Conjunctivitis is colloquially called "pinkeye," for obvious reasons. Your cat's third eyelid might be visible, appearing very red. Kitty might also exhibit signs of an upper respiratory ailment. He could run a fever and stop eating. If left untreated, not only can Kitty spread the infection to other cats, but his eye inflammation can last for months. It might appear to clear up, then recur. Because there are other causes of feline conjunctivitis, your vet must take a swab sample from the eye to test for bacteria. If the test comes back positive for chlamydia, she might prescribe oral antibiotics to get rid of the infection as well as eye ointments. Since the organism is so contagious, all cats in your household should receive treatment, even if they don't show symptoms. Rarely, people can come down with conjunctivitis from feline chlamydia. If you or anyone in your household suddenly has pinkeye, go to the doctor and tell them about your cat's condition. A vaccine is available for Chlamydia felis, but it isn't on the American Association of Feline Practitioners list of core vaccines. It's initially given in two doses 3 to 4 weeks apart, with an annual booster if your vet recommends it. As a non-core vaccine, it's only recommended by your vet if your cat is at high risk of exposure. Risk factors include an indoor/outdoor lifestyle or regular visits to a boarding kennel, groomer, cat shows or other places where a lot of different cats are in close proximity to one another. Vaccinating your cat doesn't guarantee that he won't come down with chlamydia, but his symptoms will be much milder.